The so called “Polar Vortex” has been hard enough on man and beast. Your plants have also been going through and extreme test of fortitude the impact of which will not be fully evident until late spring or early summer. There are a few things to keep in mind when thinking about your plants’ health. Leave the snow where it is. While the white fluffy stuff is cold it is actually an insulator for the plants beneath it. So when the air temperature dips to -40 the plants could still be at a balmy -8 which could mean all the difference. When the weather does finally start warming up leave your plants alone. Even though all you will want to do is play in the garden leave the pruners in the garage. The plants need time to wake from their winter hibernation. Big leafed hydrangeas, for example, may look dead but by pruning them now you can guarantee the flower buds will not survive for their summer glory. When it comes to the garden this spring just leave it alone. Do not pass go. Do not collect $200. There will be plenty of other outdoor things to do while you garden warms up and wakes up. Think Spring! 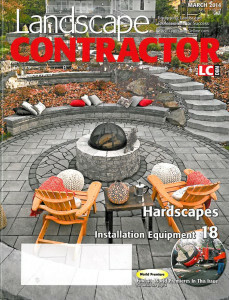 Landscape Contractor/DBM received many outstanding hardscape submissions for this issue and it was a difficult choice as to which ones to feature. So a showcase to highlight some of those not chosen was in order, and even that presented dilemmas. Ultimately, these projects were selected because they display a wide variety of styles, materials, and features from throughout the country (and one from Canada). You’ll be seeing more of the remaining submissions in future issues. As the U.S economy continues its long climb out of the hole it nosedived into, companies and organizations will find themselves with more discretionary income, which is welcomed news for industries that provide service to commercial entities. 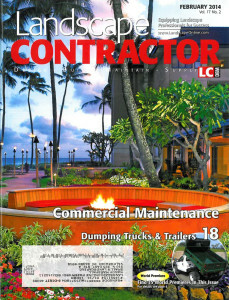 Landscape companies are among the grateful. With that in mind, LC/DBM surveyed this particular landscape to help your business set up, or ramp up, commercial maintenance services.